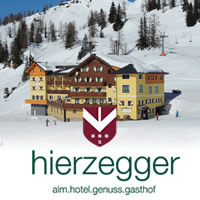 Holidays in the mountains at Hierzegger hotel at Tauplitzalm pasture! Recreation and living amidst powerful nature! In summer you stay in a peaceful, sunny location, surrounded by blooming pastures. Tauplitzalm pasture is one of the most beautiful high lake plateaus of Europe. The six picturesquely-located mountain lakes have drinking water quality and can be easily reached. Sporty guests can enjoy many alpine day trips to the surrounding summits. A special highlight is a panorama ride across Tauplitzalm pasture with your host. Our philosophy aims at creating a friendly environment worth living in that is good for our guests well-being. Our decent hotel is marked by a homey atmosphere. Our comfortable rooms feature shower/WC/hair-dryer/satellite TV/telephone; some of our rooms have a balcony. Guests can use our wellness area with sauna and resting room. Our team members have been with us for many years and our chef Josef knows how to spoil guests. We offer traditional cuisine with regional and international specialities. On request diet meals are available. Selected Austrian wines are available. Our young guests meet at the playing corner featuring many toys in winter and at the hotel's playground in summer time.